This leads to the conclusion that the sale of pharmaceuticals requires clearly defined marketing strategies and artwork production processes. Whether it is the general advertising of existing products, the redesign, or the launch of a brand new product on the market; the marketing needs to be well targeted and approached carefully. There are two types of products in the pharmaceutical industry that significantly determine a marketing approach. First are the medicines that are only given on prescription (so-called Rx medicines) and the second are medicines that can be purchased in retail (over the counter ie. OTC medication). For a long time these products were not given much marketing importance because these medicines are intended for a very narrow circle of professionals - pharmacists and doctors. Because of that, the packaging artwork of Rx products has been focused solely on the basics which are a matter of necessity. The reason for this is that a doctor who prescribes a drug was exclusively led by the patient need, so the patient takes what he is prescribed by the doctor. 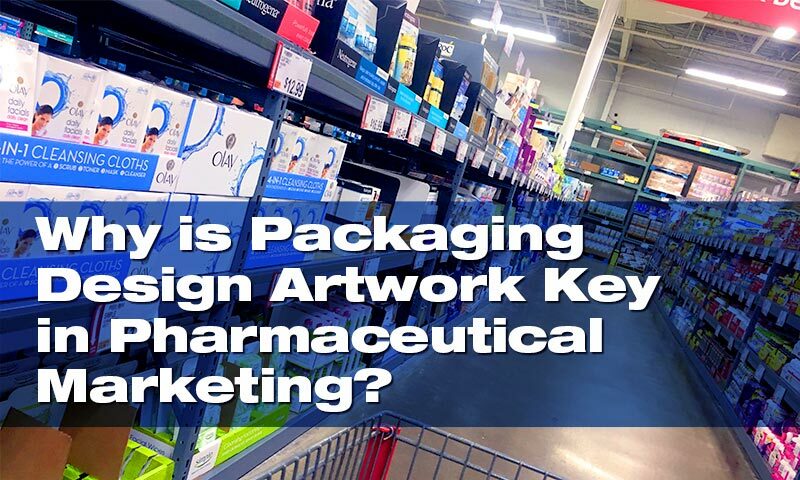 In the last few years, pharmaceutical companies have started adding significant marketing strategies to these products and their packaging artwork. The companies realized since this type of medication can not be advertised by classical marketing methods, recognisable and appealing artwork design indirectly advertise the company brand itself. A medication package should not be similar to any other form of packaging so that it can’t get confused with some other type of product. There is a general rule that non-pharmaceutical products should not be packed in packaging which resembles a blister pack (e.g. chewing gum) so that children do not get used to opening such packaging, which could endanger their safety. The pharmaceutical industry must take into account the needs of people with special needs, which is why Braille letter is an important part of a medication package. Established pharma companies have managed to use their well designed label artwork to differentiate themselves on this highly competitive market. Pharma companies which approach the marketing of OTC medication through mass media advertising are successful at reaching the end-users without the doctors intermediation. Marketing of these products allows much greater freedom for creativity in creating attractive product artwork. By accepting the importance of marketing in general, and above all, of content marketing aimed at the end-user, these companies are highly successful in marketing to targeted groups. This means that they have defined the target user well and have adapted the artwork package accordingly. Factors determining the attractiveness of packaging includes imaginative and innovative package and label artwork. It must be ensured that the product keeps its credibility as well as providing a sense of responsibility and security. Well designed OTC artwork must advertise the brand and the product by making it appeal to the buyer. It must also inform the consumer of the benefits of using the product, as well as provide the information on proper use and warnings in case of improper use. Designers are allowed to use all the benefits of modern graphics technology in order to keep the old and attract new buyers. The packaging of pharmaceuticals often contain small and intricate details, so much of the product information is often printed in small dots and barcodes. The manual inspection of these products is highly unadvisable, so print accuracy control should be carried with the use of reliable quality control automation technology. Another important part of artwork within a marketing strategy is feedback. Feedback should be collected from multiple sources and not just from those close to the company and the products. Feedback is of particular importance in the case of redesigning packaging of already existing products to get information whether the new artwork will improve or compromise the market position of the product. Good artwork contributes to the whole product experience and gives companies an effective way to make a good impression on potential consumers and to win them over. Most buyers are inclined to make a direct correlation between the quality of the packaging and the quality of the product. Honouring the brand value, established pharmaceutical companies have realised that product package artwork can be as important as the product itself.